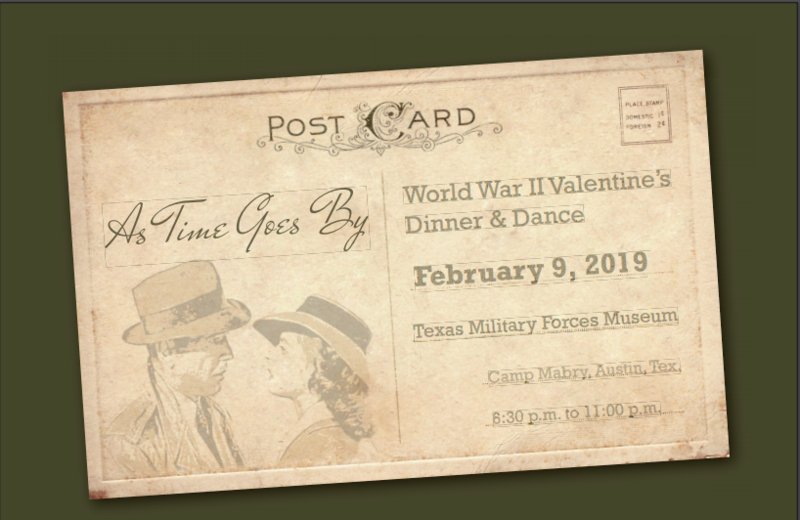 As Time Goes By is a 1940s themed dinner dance gala benefiting the Texas Military Forces Museum, hosted by the Texas Military Forces Historical Foundation. The 20 piece Sentimental Journey Orchestra will transport you back in time to World War II. Dancing, a superb dinner by Austin Catering, silent auction, souvenir glass and photo booth will make this the perfect evening. Seating is limited. Tickets are $100 each and may be purchased at the museum, by phone or with the button below. For this event cocktail attire is recommended and vintage dress is encouraged but NOT required. Your evening will begin at 6:30 pm with appetizers and cash bar available, dinner service begins at 7 pm. The museum is located at 2200 West 35th Street, Camp Mabry, Austin Texas.